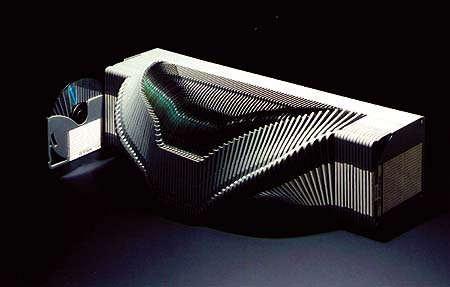 Yoshiaki Iida, ICI Design Institute Inc. Since it made its debut in 1993, this product has been a hit maker. It is one of the fancy compact disk cases now being so popular. The design, function, and price should be recognized more by the public. Because the holder revolves, compact disks are easily put away by either hand, at the same time, it is possible to add more since parts are connected by screws. In this information oriented age, audio/visual language for compact disk is based on the idea of "0" (beginning) and "1" (result), of which detail is digitalized so that emotional message appears. In other words, the detailed information makes us be conscious of further understanding and deep expression. This product is a key to let our mind move toward appreciation of audio/visual language. As we put away/take out compact disks, we unconsciously be aware of the numberless moments in between the states of "0" and "1," that is, the infinite vague situation in which understanding/expression bears.